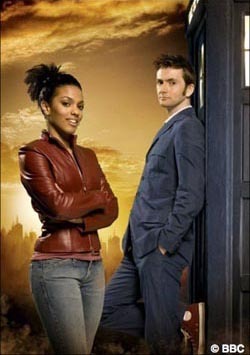 SPOILER WARNING: This little diddy about Freema Agyeman contains all sorts of spoilers for the current season of one of the BBC’s most famous creations, “Doctor Who.” The long-running program, revived in 2005 after an extended absence from the airwaves, just finished its third-season run in the United Kingdom. The Tee Vee Gods are now airing those episodes in America at 9 p.m. EST on Fridays on the Sci-Fi Channel. Yes, Martha Jones is very pretty. But try to ignore that, because she’s also a doctor—well, almost. Then she meets a bloke (well, an alien from another galaxy who just so happens to look and sound like a British white man 🙂 ) who actually calls himself The Doctor, and she falls head over heels in love with him. So when he asks her to follow him around time and space in what looks and sounds like, to American eyes and ears, a blue public telephone booth that makes a wheezing noise like an old freight elevator travelling between floors, she readily accepts. Round and round Martha goes, piercing eternity and infinity. She meets Shakespeare, who gets such a hard-on for her, he composes sonnets to his “Dark Lady.” She visits New York City thousands of years in the future, then returns to Manhattan during the 1930s to fight some evil-looking R2-D2s. 🙂 In between adventures (and, somehow, during! ), she blogs on her MySpace page. Martha’s mother didn’t take to The Doctor at first, but her brother and sister seemed to be fine with him. (Psst! Shhh! Here’s a whole episode to watch so you can see The Doctor and Martha out on a “date” with her family around her. Don’t snitch!) 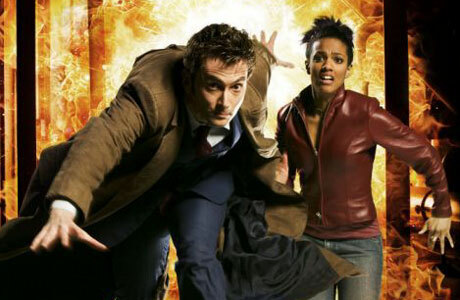 Martha decides to defy her mother, and stay with The Doctor, regardless of the danger. She’s hooked on him and the experience. And so it went. Until the trip got heartbreaking, and then really scary. Then she had to leave The Doctor and travel the Earth in order to save him and it. Truth be told, Freema Agyeman said she was a Trekker at first. Her story goes something like this: Working at a video store, the struggling actress appeared briefly in the Season Two finale two-parter, “Army of Ghosts”/”Doomsday.” Then she was told by the “Doctor Who” producers that she was up for a role in the “Doctor Who” spinoff “Torchwood.” After auditioning came the big reveal: she got the “Doctor Who” role—the co-lead, replacing the super-popular Billie Piper. Although she’s not The Doctor’s first non-white companion, she was billed as the “first official” (read: main) Black companion, for the sake of PR, etc. She’s now a star. And she’s been very kind and gracious about it. Overnight, she’s an action star and even an animated cartoon character. As an overwhelmingly white show, “Doctor Who” doesn’t really have a racial history to talk about. In the 1970s, the show did a story, “The Talons of Weng-Chiang,” that had seemingly every Asian male stereotype possible. Blacks were few and far in-between. That changed greatly with the show when it was revived in 2005. On the new show, Blacks were heroes and villians, and everything in-between. The addition of Martha/Freema as the show’s second-lead was just part of the new racial mix. You’ll just have to see on Sci-Fi how Martha gets her heart broken before saving the world—and how those two stories are related. I thought the whole season was GREAT. I’m happy that Martha’s story will continue next season. 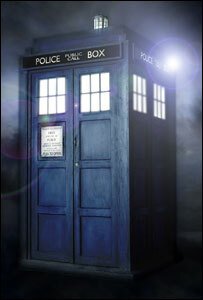 But with history made, the TARDIS will now get a little crowded. I feel bad that it seems that Freema got demoted on her own program, but the show does have to change as it goes into its fourth season next year. At least Martha is still a force to be reckoned with—and, as you’ll see, she more than earns her stripes. All hail The Doctor—Martha, that is! This entry was posted in television, world history. Bookmark the permalink.